Azerbaijan’s President Ilham Aliyev has congratulated Indonesian counterpart Joko Widodo. 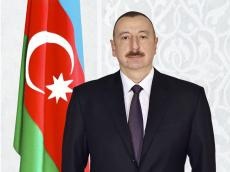 “On my own behalf and on behalf of the people of Azerbaijan, I extend my most sincere congratulations to you and the people of your country on the occasion of the national holiday of Indonesia, Independence Day,” the president said. President Ilham Aliyev has also congratulated President of Gabon Ali Bongo Ondimba.